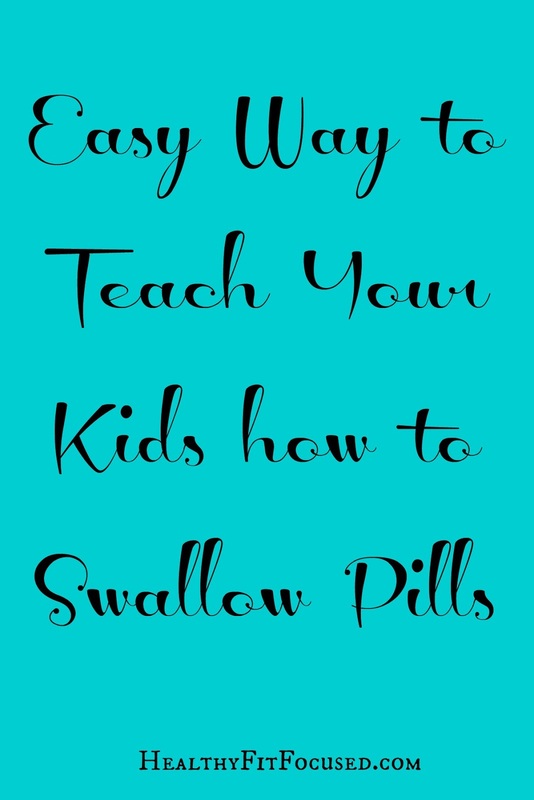 How many of you have struggled with helping your kids learn how to swallow pills or vitamins? I remember how difficult it was growing up and having to make that switch from "chewable" to "grown-up pills". Let's face it, it's a necessary skill every kid has to learn (and every parent has to figure out how to teach!). Just yesterday we were sitting down for a weekend family breakfast. Our vitamins were out on the table and we had just run out of the kid "chewable" vitamins. 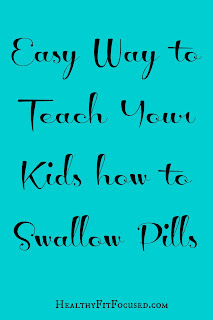 My daughter was getting over being sick, and my hubby and I thought this was the perfect time for our kids to "learn how to swallow pills", (mind you, they are 8, 11, 12...the time is right!). So, my husband said, "ok kids, we're out of the kids vitamins so it's time you learn". Moans and groans and complaints started flying out of the kids' mouths. I could see some giant tears getting ready to form in my youngest's eyes with the thought that he'd have to "swallow" something! Now, our vitamins aren't "sugar coated" and are fully natural and organic so they don't taste good if they stay in your mouth for longer than it takes to chug some water down! We warned them of this, so told them it must be quick! "Ok, here's what you'r going to do...put the vitamin in the back of your mouth on your tongue, then take a huge drink of water and keep drinking." my husband said. Well, my little guy just froze. My oldest decided he was going to be the pro and "show up" his siblings, and with one gulp...he was done (and letting us all know about it too!). My daughter, well, not to be outdone by her brother decided to try. We reminded her to drink quickly! In went the vitamin, the water started to go down the hatch...and suddenly, she stopped. Then came the faces of complete disgust, moved onto the gagging and "fake" throwing up motion (not dramatic in the slightest, lol). Then all of a sudden, it gets spit out on her empty plate. Well...that was an epic fail! As moms, we always have to be thinking... So, I went to the kitchen, grabbed 9 mini M&M's for them to "practice" on. My oldest got to eat all 3 because he already succeeded! My little guy immediately ate one before I could even explain what was going to happen. My daughter waited and probably wondered how this was going to help her! "Ok guys, here's what you do...Jeremy, you get to enjoy yours since you already swallowed your vitamin. Anthony and Katelyn, here's the deal. 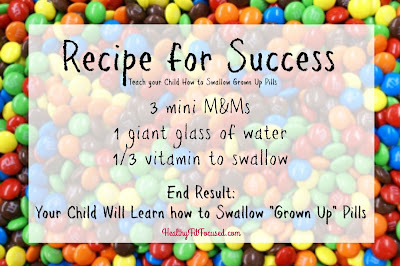 You're going to practice with a mini M&M, put it in the back of your mouth and swallow it down. IF you can swallow that down the first time, then you get to EAT the remaining M&Ms that you have and you don't have to practice anymore!" Their eyes lit up with excitement at this point! Anthony: "Well I'll take on that challenge." M&M in the mouth, water down the hatch...and his finger in his mouth searching for the M&M that he surprisingly couldn't find!! "I DID IT!! IT'S GONE!!" So, we cut up a vitamin into thirds and gave it to Anthony and Katelyn. Anthony did the same thing as the M&M, and magically it disappeared!! BOOM...down the hatch!! "GREAT JOB Anthony!! You can NOW enjoy your 3rd M&M!!" Well, not to be outdone by her younger brother, she knew she needed to do the same, but was very hesitant because of her previous attempt! Finally, she did it...one M&M down the hatch, followed by the vitamin and BOOM...she gets to enjoy 2 M&Ms!! So there you have it! An easy way to help your kiddos learn how to swallow pills and graduate from chewables to grown up pills!! We'll have to try that with the other "grands."